Set of 4-2" poly strap with rubberized pre-molded handle for a no-slip grip, choose red or black below. The Load Grips assist the user while lifting by extending the handle a flexible and adjustable 13 inches. 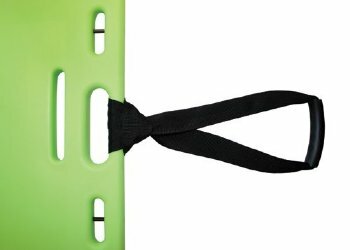 Designed primarily with backboards in mind, Load Grips make it easier to lift with the proper technique, relieving lower back pain. They also prevent scraping of the knuckles on the ground and minimize contact with the patient while carrying the board. This is extremely helpful when the backboard handles are difficult to access due to the size of the patient. The flexible and adjustable nature of Load Grips ease transporting patients through stairways and awkward or confined spaces. Try Load Grips with other heavy gear, like fire hoses or to extend a handle. Use to lift backboards and other heavy and awkward gear. Durable and long lasting with normal cleaning protocol. 2" poly strap with rubberized pre-molded handle for a no-slip grip.